This piece is about the highs and lows of relationships, and in particular, about deciding to embrace a moment, a year, and making the most of it. I used traditional "Welcome to Our Home" cross-stitch samplers as the inspiration for this piece, since those samplers often have a prominent place on a home's wall, welcoming visitors. In this case, the piece is meant to welcome the inhabitants of a home and serve as a daily reminder, an affirmation, of the possibility of a fresh start, no matter what has come before. The piece is 10 inches wide--it's the largest piece I've ever stitched--and is done on linen aida cloth. It took what seemed like ages to stitch, but I'm happy with how it turned out. 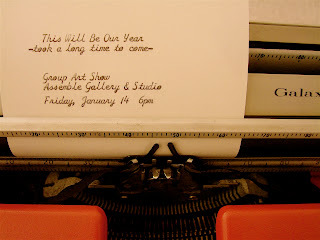 If you're in the Seattle area, I hope you'll stop by the show; it's up until February 8.